You know how in the difficult, dark moments of life, people try to lift your spirits? If you are like me, then you appreciate the sentiment, but not necessarily the comment. You know that the person meant well, but you are still hurting…still struggling struggling. Maybe you respond, “Thanks, I Know.” Or maybe you smile, nod, and let it go. Or maybe you feel some kinda way about it (the kinda way that is about anger and frustration). We’ve all been there at one time or another. Here’s the thing: people will try to solve your problems for you out of their sincere care for you. We all have this instinct to try to abolish the darkness, to be the light for someone else, to wipe away the tears and cultivate a sense of hope and comfort. The intention is good and noble. But the effect is not. The truth is trying to solve the problem for someone actually strengthens the problem. Sounds ironic, I know, but trying to solve it actually strengthens it. Trying to wipe away the darkness only gives more power to the darkness. Psalm 23 takes a completely different approach. Reflect on it for a moment.What do you hear in Psalm 23? The struggle is still there. The pain is still present. The darkness is not gone. But there is something else there with the darkness. In the midst of the pain there is presence. …For you are with me! …You prepare a table for me! 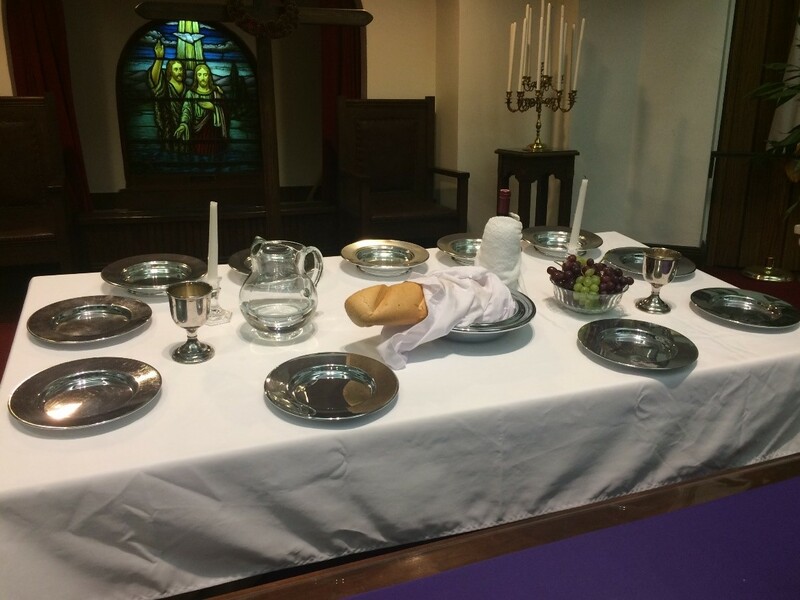 In the midst of darkness, the shepherd is present, holding a rod and staff and preparing the table of grace – a table which reminds us today of communion…communion with God and with one another. The point of Psalm 23 is not fixing a problem but being present in the midst of every problem. You don’t have to fix the darkness. What gets each of us through the darkness is presence, that is, not being alone as you go through it. This is a key teaching of Psalm 23. This is why we read Psalm 23 at funerals and memorial services: to remind us that what is important at such a dark and difficult time is presence, connection, and relationship….with God and with one another. Presence helps us navigate the darkness. I learned a long time ago that you cannot really change anyone. You can try. You can argue someone to death. You can beat them over the head with the Bible, call them names, put down the way they see the world. You can be the smartest person in the room, but you cannot change someone’s mind for them. What you can do is be present with a person in the midst of whatever they are walking through. You can be a presence in someone’s life in a way that invites them to see something new. Let me explain in another way what I mean. I am tired and weary of all the name calling in our country right now. Folks on every side of every disagreement act as if calling someone a name will change something. Conservatives call liberals socialist, anti-American, baby-killers. Liberals call conservatives hateful, anti-immigrant, racists. Do people think that kind of language is changing anyone? If you do, then you may be crazy! Across these groups, folks don’t even have the same definitions of the word they are using. So, there is inevitably an argument. I’m not racist because… or I’m not anti-American because…. And then the one group uses that same name against the other group! The conservatives say its the liberals who are really racist. And the liberals say its the conservatives who are truly anti-American. And it even happens in the church! Listen to how some pastors are using name-calling from the pulpit! I submit to you that such behavior whether from the pew or the pulpit is sinful. Am I getting political from the pulpit today? Well, if I am, then I am calling all of us to account for the ways we speak ill of one another. I am calling us to account for the ways we try to fix one another as if insults will bring about a change of heart and perspective. If I am getting political, then it is about the politics of the Bible, the politics of Jesus, our Good Shepherd, who says essentially this: you are not called to fix one another. No! You are called to walk with one another through the green pastures and dark valleys. You are called to be present, to listen, to provide, to comfort, to sit at the table of grace together. Now look, I am not saying let’s hold hands and sing Kum-bah-yah in the midst of deep disagreements over which people’s lives are quite literally at stake. Not at all. What I am calling for a a change of strategy and tactic. I am calling us to stop treating one another as problems to be solved through any means necessary and instead to treat one another as people to be loved. I am becoming more and more convinced of this: change begins with presence. For the writer of Psalm 23 change began with the presence of the Lord, the good shepherd. For two men who hung on crosses on Good Friday, change began with the presence of Jesus on that third cross. For David, change began with the presence of Jonathan. For Paul, change began with the presence of Anninias. For Job, change began with the presence of God in a whirlwind. For Moses, change began with the presence of God in a burning bush. For the Jews of the early church, change began with the presence of Gentiles. And in everyone of these stories, change was not forced, it was not coerced. No one called names. No one spoke ill of the other. No one was beat up, push aside, or devalued. Instead, one was present to the other to walk with, to ask questions, to be a mirror for reflection, to offer a rod and staff for comfort, to prepare a wide open table that everyone could sit down at together. Change begins with presence, the kind of presence in which we love our neighbors as ourselves. This past week as a man walked into a mosque in ChristChurch, New Zealand, he chose to use the strategy or terror and murder. He could have walked in there and sat down to listen, to walk with others,. He could have asked someone who was different from him to walk with him. He could have prepared a table for the Muslims in the mosque. He could have sat down and recognized his common humanity with the people in that room. While there would no doubt have been disagreements, there could have been presence. There could have been the kind of presence that we are promised when two or three are gathered. You see, when we are present to one another, truly present, gathered together at the table, God promises us that the Holy Spirit will be there. And that kind of presence changes people and can change the world. And whatever you believe or understand about this act of terrorism in New Zealand, you have an opportunity right now to be present with others in the dark shadow of this horrific event, to walk together, to work for peace and wholeness and comfort and justice. Brothers and sisters, in the midst of busy lives that may seem to offer not enough space to solve problems like we have witnessed this past week, the answer is not simply to find more time or be less busy. The answer to our busy-ness is to create a tempo of life that is about presence with one another and God. Set aside those tasks and behaviors that fail the test of true presence. And create a tempo in which whether fast or slow, the song is a love song of presence. For the presence of love is how God changed the world on Easter morning! May we be resurrected from our old ways into God’s way of love and presence. God, we pray for a day when we can see the people around us as your creation, infinitely loved by you. Mend our eyes to see our neighbors in this way, so that we may more fully live out your commandment to love our neighbors as ourselves. Amen.